Every seat in the Ruth H. Barrus Concert Hall was full for both performances of the Barbershop Music Festival on Feb. 4. The BYU-Idaho Women’s Chorus began the festival with song and dance. After the opening prayer they continued with “Sweet Hour of Prayer” and a choreographed routine of “High Hopes” that had singing rubber trees and a fighting ram. The audience laughed and cheered as the night of music continued with student quartets. Four Guys in Ties was a gro of Madison High School boys that had participated in the day’s clinic with guests Tori Postma and Jim DeBusman. 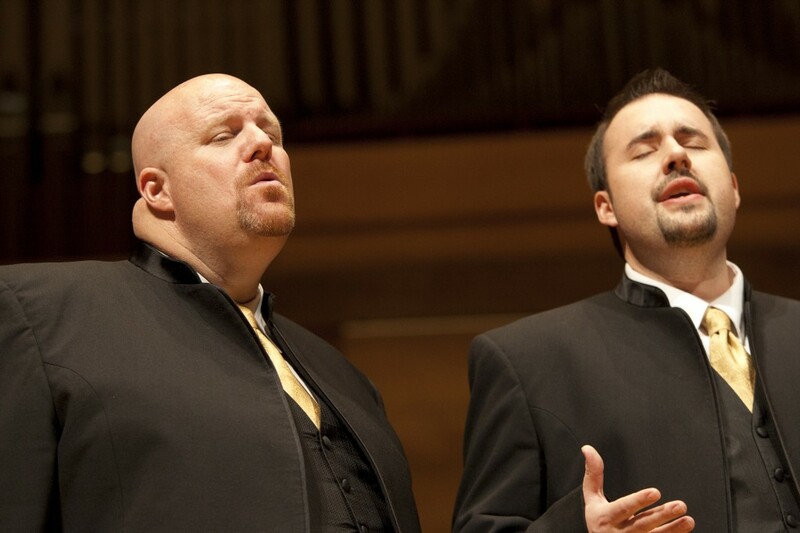 Postma performs in the award-winning quartet Bounce, and DeBusman is a retired music educator. Royal Flush sang an arrangement of “For the Longest Time” followed by ClichE’s “Silhouette.” Then the Rexburg Carousel Chorus entered the stage. The gro is made of men who live in the area and practice once a week. Led by Michael Reed, the gro sang “God Bless America” and “Irish Blessing.” Reed said the heart and soul of the gro was put into the performance. More student quartets followed the Carousel Chorus. “We Go Together” was one of the songs performed by the quartets. The BYU-Idaho Men’s Chorus and director, Kevin Brower, took the stage to sing three love songs. “Come Go With Me” included a can-can line and a bended knee finale. “For All We Know” was the gro’s serious song according to Brower. Before the last song Brower told the crowd, “Imagine Freddie Mercury on the stage, but with his shirt on.” The chorus then sang “Crazy Little Thing Called Love” with snapping fingers and air guitars. Husband Hunters, The Next One, and Some Guys performed in the final student quartets. Daniel Johnson, a member of the quartet “Some Guys” said his gro sings at every opportunity on campus but the Barbershop Festival is the most fun. “Live music is completely different than recorded music,” Johnson said. “Coming to watch the live music is more engaging and entertaining. Juliana Avery, a freshman studying English, enjoyed the variation of the night’s performances and the big sound.